THE STORY - With their headquarters destroyed and the world held hostage, members of Kingsman find new allies when they discover a spy organization in the United States known as Statesman. In an adventure that tests their strength and wits, the elite secret agents from both sides of the pond band together to battle a ruthless enemy and save the day, something that's becoming a bit of a habit for Eggsy. THE GOOD - Characters are as fun and memorable as ever. The film is aware of its own over the top antics and humor allowing for us to enjoy it more. THE BAD - Action scenes are dizzying and hard to follow. The film runs a tad bit too long. Lack of emotional stakes. ​When Matthew Vaughn dropped “Kingsman: The Secret Service” on us in 2014, many did not know what to expect. What we got was a whacky and wild action film that paid homage to spy films of the past including the popular James Bond franchise, while updating the typical genre tropes for a modern age with several unique twists thrown in. “Kingsman: The Golden Circle” is more of the same which is good news for those who loved the first film. However, those hoping for another unique tale from Matthew Vaughn may be disappointed to find a rehash of the first film with many similarities. 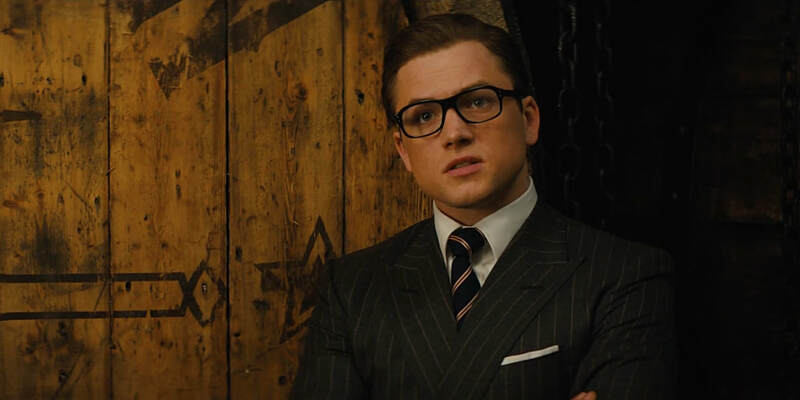 Taking place after the events of the first film, Eggsy (Taron Egerton) is a full fledged Kingsman now after the death of Harry (Colin Firth) from the first film. Eggsy is called into action after a deadly missile strike rocks the organization and leaves him and Merlin (Mark Strong) with little to no resources to seek retribution. In need, they turn to “The Statesman,” an American spy organization based in Kentucky who love good whiskey, country music and all things America (Played by Channing Tatum, Jeff Bridges, Halle Berry and Pedro Pascal). Together, they must stop Poppy Adams (Julianne Moore), a drug lord based in Cambodia who has formed an organization called The Golden Circle where she is planning to unleash a deadly disease through commonly used drugs and then holding millions of their lives for ransom. Let’s talk about the aspects that “Kingsman: The Golden Circle” gets right first. The first film’s villain was a memorable one, giving legendary actor Samuel L. Jackson the opportunity to give us a character unlike any other he had played before. Here, Julianne Moore is given the opportunity to portray another off-beat and unique villain and she absolutely knocks it out of the park. A non-menacing, unhinged criminal mastermind who has a love for the 50’s, Moore sinks her teeth into the role and you can tell she is having a tremendous amount of fun doing so, She surrounds her Cambodia based criminal enterprise with 50’s memorabilia including going so far as to kidnap Elton John, who she uses to play songs for her. The only thing that is not modern about her criminal operation is her utilization of robots (Including robot dogs) because she claims they obey orders better than humans do. “Kingsman: The Golden Circle” also takes advantage of its talented cast and uses its extended 141-minute runtime to make sure every star gets their moment to shine. No one feels wasted, disregarded and if Vaughn has done anything with this franchise, it’s that he has made his characters and the relationships they share with one another feel important. The music in the film by Henry Jackman and Matthew Margeson is also soaring at times with a devilishly unique theme for Poppy Adams and a orchestral version of John Denver's "Take Me Home, Country Roads" that helped to give this sequel a unique flavor. The film is also very self-aware of how ridiculous it can be at times and as a result, the jokes land very well for the most part. However, there are some times where they don’t. And here is where we come to some of the issues with this film. “Kingsman: The Golden Circle” much like the first one, walks a very fine line with being too over the top for its own good. One dizzying fight too many. One ridiculous gadget too many. The characters are never in any real danger because they seemingly have a way out of everything with gadgets that have little to no set up beforehand in terms of how they work and how they will come back around later to pull our heroes out of a pickle. A deus ex machina early on the film revealing how a thought to be dead character is now back, robs the film of any and all future danger henceforth. If Matthew Vaughn had the balls to not go this route then it’s apparent that the other many deaths in the film would substantially carry more weight. “Kingsman: The Golden Circle” will certainly please fans of the first film who are purchasing a ticket expecting more of what they got the first time around. It does not try to reinvent itself or push any boundaries, other than how asinine it can make its next action sequence. The characters and the actors portraying them is what keeps the film afloat, shaky accents and all, with humor and charm that is irresistible at times. Overall, Matthew Vaughn gave us yet another crowd pleaser with “Kingsman: The Golden Circle” and I’m sure we will get another one eventually. My only hope is that it carries more substance and consequence, because once it’s over and the feel good moments have worn off, “Kingsman: The Golden Circle” feels like an afterthought.